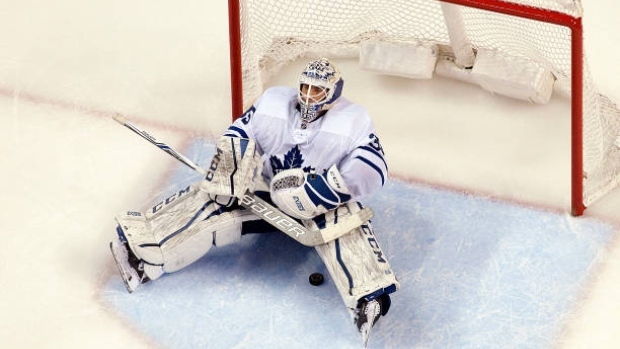 Both goaltenders waived by the Toronto Maple Leafs on Monday were claimed Tuesday by Eastern Conference teams. The Carolina Hurricanes claimed goaltender Curtis McElhinney, while the Philadelphia Flyers claimed Calvin Pickard. The Leafs are moving forward with Frederik Andersen as their No. 1 once again, with Garret Sparks behind him. "Good for Mac. Good for Pick. Too bad for our depth," Maple Leafs coach Mike Babcock said Tuesday. McElhinney, 35, posted an 11-5-1 record last season with a .934 save percentage and a 2.15 goals-against average. He recorded three shutouts in 15 starts on the season. He appeared in three games in the preseason for the Maple Leafs, recording an 0-1 record with a .914 save percentage and a 3.02 GAA. He edged Sparks in each statistical category in the preseason, but the Maple Leafs opted against risking last season's AHL goaltender of the year to waivers. "(Carolina) did an unbelievable in getting Mac," Babcock said. "Great person, great family, good pro, does it right every day, good goaltender. Quality man. "Pick is another quality, quality guy. Unbelievable last year for Sparks helping him become a good pro. Good numbers in the National Hockey League, so he'll do a good job, but he's a great teammate and so we're going to miss those guys. (Kasimir) Kaskisuo now in the minors, he is standing by himself. And yet that's the way the league is made. It's made to try and keep everybody exactly the same, that's the way it goes. You'd love to have them all slip through but they didn't. McElhinney joined the Leafs in 2016 as a waiver claim from the Columbus Blue Jackets. He owns a career record of 62-71-12 with a .909 save percentage and a 2.86 GAA. He made his NHL debut during the 2007-08 season with the Calgary Flames. In Carolina, McElhinney will battle for starts with Petr Mrazek while Scott Darling recovers form injury. It's unclear how much time Darling is set to miss. Pretty decent chance one, possibly both, could be re-claimed by TOR in two or three when CAR and PHI starters get healthy. Pickard, acquired by the Maple Leafs from the Vegas Golden Knights last fall, had a 21-9-1 record with a .918 save percentage and 2.31 GAA in the AHL last season with the Toronto Marlies. He played in one game for the Leafs last season, allowing four goals on 24 shots. The 26-year-old is two years removed from playing 50 games with the Colorado Avalanche. He had a 15-31-2 record with a .904 save percentage for the last-place Avalanche in 2016-17. Forward Remi Elie was also claimed off waivers Tuesday by the Buffalo Sabres from the Dallas Stars, while the St. Louis Blues lost Dmitrij Jaskin to the Washington Capitals. All other players waived on Monday cleared. Elie had six goals and 14 points in 72 games with the Stars last season. The 23-year-old was a second-round pick in the 2013 NHL Draft. Jaskin, a second-round pick in 2011, had six goals and 17 points in 76 games with the Blues last season. The 25-year-old scored a career-high 13 goals and 18 points in 54 games with the Blues during the 2014-15 season.